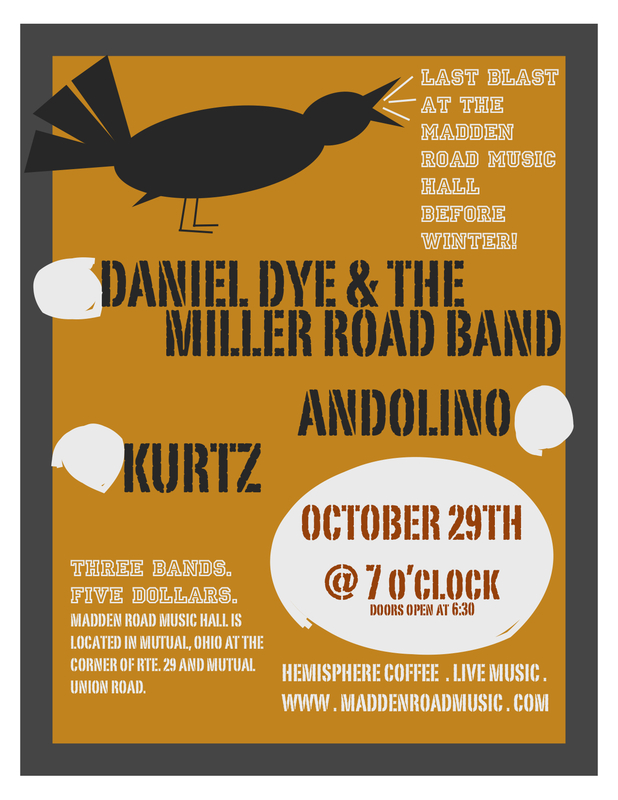 On Saturday, October 29th, starting at 7 pm Madden Road Music Hall will be hosting three Ohio bands. Kurtz, a brother/sister duo from Mechanicsburg will start the evening by playing a mix of originals and covers. Trent and Trudi recently wowed a Madden Road Music Hall audience with their unique Indie Rock and blood harmonies at Madden Road MusicFest, and their fans are begging for an album. They will be followed by Andolino, an up-and-coming central Ohio five member band which has previously performed at The Basement and Newport in Columbus, and has toured across the USA. Andolino is primarily known as a rock band, but lately it has dabbled in the acoustic/folk scene, showing its diversity, and getting rave reviews by its loyal fan base. Daniel Dye and the Miller Road Band will follow with its mix of Americana/Folk/Bluegrass. DD and the MRB has been compared to newer bands such as The Avett Brothers and Mumford and Sons, and familiar singer/songwriters Johnny Cash and Bob Dylan. Dye’s debut album has been featured on WYSO 91.3, southwest Ohio’s NPR affiliate radio station, and the band is in the pre-production stage of its second album. All members of these bands play a variety of instruments, so be ready for an evening of cello, violin, guitar, cajon, mandolin, banjo, accordion, xylophone, viola, harmonica, keyboards, drums, ukelele and kazoo. Hemisphere Coffee Roasters will be at the concert with its sublime drinks as well. The admission is $5, and tickets will be sold at the music hall, but can be reserved by emailing maddenroadmusic@gmail.com. Doors open at 6:30. Call 937-244-6481 for more information. Previous Site of the Madden Road MusicFest is Taking Shape!